House Alder in Zurich. Before making the decision to build a new home, the owners lived in a small gabled house for 25 years, situated in the very popular residential area along the Trottenstrasse in Zürich-Wipkingen. The new volume should be as high as possible to make sure that the breathtaking view is ideally captured from the upper floors. The architects’ task was to develop a harmonic and sculptural volume by exploiting the building regulations (distance between buildings, bay windows, offset of roof fascia) and applying them in a way that laymen wouldn’t recognize them as such. This process of exploiting and making invisible led to a complex structure which experiences a classic devision into three parts - a concrete base, two masoned middle floors and once again a concrete built attic floor which takes up the area’s predominant way of building with gables by playing with roof slopes and pitches. Base and attic which are made from cast-in-place concrete exploit its plastic potential. Two cuts in the base floor create a covered entrance towards the Trottenstrasse and a sheltered seating area for the granny flat towards the garden. In this way the concrete base elegantly carries the calm masoned middle part which does without any projections or offsets and corresponds to the maximum possible footprint. The attic with its different slopes and an integrated terrace forms a hat-like finish and embraces the masonry together with the base. In contrast to the two crystalline concrete floors the middle part appear soft and textile due to the welling mortar. A sculptural staircase connects the two middle floors, the attic floor and the additional roof terrace to an sequence of rooms. 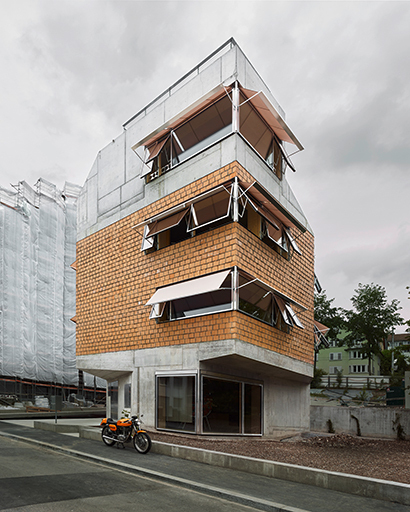 Situated at the very top is the generous in-eat kitchen which is characterized by its roof shape and is overlooking the industrial area of Zurich, the lake and the Alps. A panoramic corner window frames the stunning view like a painting. The materialization is kept ‚brut‘ throughout the whole building. However, base and attic floor are insulated from inside to create a comfortable and cosy atmosphere. The masoned middle part is made of double layer brick walls with an in-between insulation. The mortar on the outside was deliberately not removed to lend the wall a textile expression and to make the craftsmanship visible. On the inside the mortar is removed but the walls remain without plaster and show there decorative quality. By using the actual back of the brick as the visible side, the traces of the storage on a perforated plate are shown and used to create a wallpaper-like look. Elegant wood/metal windows are contrasting the raw brick with their fine design both in and outside. The combination creates an exquisite architectural expression which changes between being down-to-earth and extravagant. In summer the hinged windows and the hinged fabric blinds give the building a light and playful appearance.